You can still win millions from within the United States! Americas Cardroom, which leads the Winning Poker Network, is hosting another $1,000,000 guaranteed event on Sunday, August 2nd, at 3:00 PM ET. Players can buy-in directly, or qualify for as little as $5, through satellites. Late registration is available for 5 hours. Unlimited re-entries available for the first 20 levels. 10,000 starting chips with 15 minutes levels. Americas Cardroom is the flagship site for the Winning Poker Network (WPN). It is available to online poker players worldwide, including the United States. However, it does not serve the three states in the U.S. which are already under a regulated environment (New Jersey, Nevada, and Delaware). If you have not signed-up for an account with Americas Cardroom, you are eligible for a 100% Initial Deposit Bonus up to $1,000 when using our Bonus Code FTR1000 upon making your first deposit. 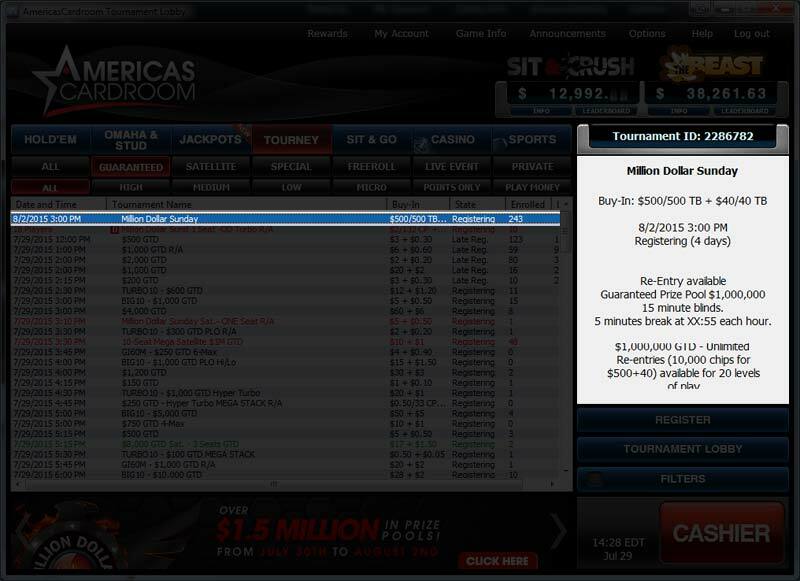 Sign up for an Americas Cardroom account here! Good luck to any members playing in this! Still trying to win my ticket via satellite. This event starts in less than 3 days. Good luck in the satellites eberetta, that would be an awesome game to play in! Less than 24 hours to go until this event starts! Less than 12 hours to go until this event starts! Less than 6 hours to go until this event starts! Less than 3 hours to go until this event starts! Less than one hour to go until this event starts! The password has now been released to Qualified Members! did anyone play? i wasn't able to satty in. Looks like the tournament ended with about $30k in overlay, i would have thought it'd be higher. Last edited by givememyleg; 08-03-2015 at 10:30 AM.